Blowout Sale! 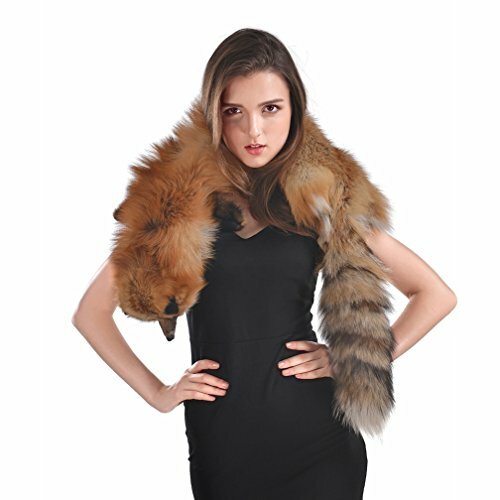 Save 51% on the OLLEBOBO Women's Genuine Fox Fur Scarf Winter Elegant Shawl Pashmina red fox by OLLEBOBO at Laurenee Lifestyle. MPN: ZHQF0521. Hurry! Limited time offer. Offer valid only while supplies last. 100% Genuine Fox Fur, which is long, soft and fluffy(the animal is feed on the farm, not wild) This gorgeous collar will enhance any jacket or coat. This gorgeous collar will enhance any jacket or coat. All you need to do is drape it over your shoulders and use the invisible fur clip to snap the collar closed securing it in place. You can also wear this collar over a sweater. 1. Please refer the size carefully. 2. Real Fur garment, cannot Ironing, hanging outside exposure of sun-shine and lights, only can be professionals dry-clean. 3. Due to the fur product was pressed in the parcel for a while and it is made of real fur. It might be out of shape since the fur is soft. It is possible. when you receive it, pls shake it for some time before you try it on, or hang it up in cool air for about some times. It will be more fluffy. Fox fur new style for the 2016/2017Winter Trend. Our professional design makes it comfortable and fashionable. Wear it for more warm and charm. It's Soft and fluffy. Fur Woven product. It does not shed or fade color as far as it is taken due care of. Real Fur garment, dry-clean only, cannot Iron or be exposed to lights (especially sun-light). Please pay attention: As it is made from natural rabbit fur, it is possible that the clothes might deform a bit because of the parcel pressure during delivery. When you receive the product, please shake it or hang it in in an airy place for some time before you try it on. Please Check The Product Description of the size Before You Buy! If you have any questions about this product by OLLEBOBO, contact us by completing and submitting the form below. If you are looking for a specif part number, please include it with your message.